The last summit finish of this year’s Tour de France, the last real chance for GC guys to put time into Chris Froome before Saturday’s time trial. But in the 179km stage, it really was only the last 10km that felt like a race. Warren Barguil already clinched the KOM jersey for 2017 earlier in the stage, but he saw his chance, he attacked out of the yellow jersey group just under the 10km mark to bridge the 2mins and hunt down Darwin Atapuma to take a solo win on the mighty Izoard. Chris Froome was never in difficulty, finishing comfortably in yellow while Romain Bardet took a few seconds from Rigoberto Uran to swap podium places. This Tour has been a revelation in a few ways – Michal Kwiatkowski‘s performance is one we waxed lyrical about yesterday – but the revelation that just keeps unfolding is that of the riders on Team Sunweb. And my Rider of the Race is the undisputed King of the Mountains and Conquerer of Izoard, Warren Barguil. What’s not to love about this guy? Coming off a couple years of real disaster – that terrible car crash in January 2016 that left six then-Giant riders, incl Barguil, with broken bones and horrific memories of the day, then Barguil’s fractured hip in a crash at Tour of Romandie in April this year – the man they call WaWa has led us cheerfully over Cat 1 cols and HC passes in his dogged pursuit of the polka dot jersey. What could have been better than the Frenchman winning on Bastille Day? Well, the Frenchman conquering Izoard for his second solo stage win this Tour. And he did it with some panache. Barguil saw his chance under the 10km mark when Ag2r were rearranging themselves from the front of the GC group to, well, out the back, and as the Sunweb rider was no threat on GC, the main men let him go his merry way. Followed by Alberto Contador (whom he dropped to jump over him in the top 10), Barguil rode with intent when he realised that he could catch race leader Darwin Atapuma and possible win the stage. Clearing the flamme rouge, Barguil blew past Atapuma and rode the final 800m to glory. Last night I was discussing it with Michael [Matthews – his roommate for the Tour] and we never would have expected that we could have the polka-dot and the green jersey and to win two stages for him and one for me, now two. It’s just unbelievable.
.@WarrenBarguil 2️⃣ – 2️⃣ @blingmatthews. 1 Chris Froome hasn’t had to put in any kind of sustained attack all Tour – and unless he wins the TT on Saturday, he will be on the top step in Paris without a stage win to his palmares this year. The team hasn’t put a foot wrong this Tour, which meant Froome was never in any real danger, save a rogue moment or two. That’s pretty impressive. 2 Just how high is Michal Kwiatkowski’s pain threshold? After yesterday’s gut-wrenching ride at the front of the peloton, the Polish rider was at it again. His riding was so intense, he threw his Oakleys to the side of the road halfway up Izoard and then came to an absolute stop once he peeled off. (It then took him 14mins to ride 4km to the top, apparently.) Astonishing. 3 Spare a thought for Darwin Atapuma – he thought he had it. ‘I’m under the flamme rouge. What could possibly go wrong?’ Swoosh – he saw spots. Red ones. On a white jersey. Riding right past him. I love that he looks so thrilled with his combativity award. 4 Ag2r really shouldn’t play Sky at their own train game – they just burned their own brown-bibbers and then Sky unleashed The Landa Gambit™ . Romain Bardet did what he could but Froome was just too strong. But hey, at least they tried. In hindsight (always the smug perspective of bloggers), they should have capitalised on their double-trouble attack last weekend rather than waiting for today, when the element of surprise was nowhere to be found. Bardet still has to ride a stonking time trial on Saturday, even though the chances of him taking time on yellow is unrealistic – but he’s in 2nd by just 6sec over Uran. So you’re not finished yet, Bedhead. 6 Fabio Aru had a mare of a day, with Dan Martin particularly trying his best to break the Italian national champion. He did break him but not enough – Aru may have dropped to 5th with Mikel Landa taking 4th but Aru is still a minute up on Martin. 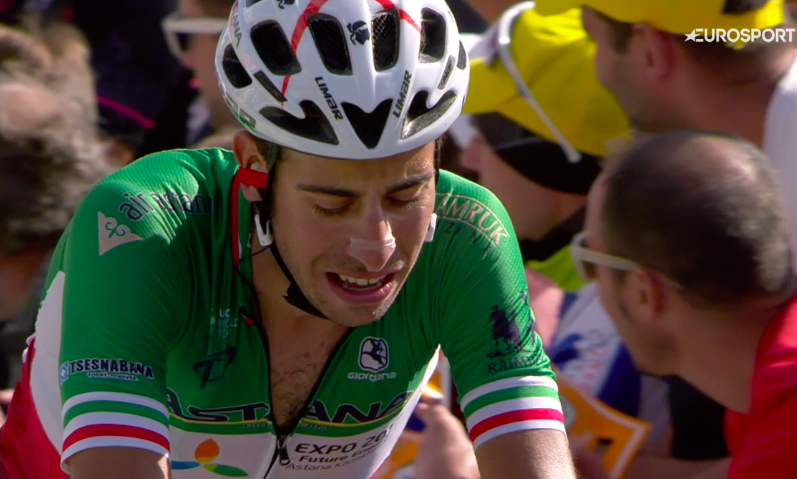 There’s one thing you can say about Aru – he does not stop trying, not matter how far down he is, no matter how immodestly he has to ride to limit his losses. That’s something to admire. Header image: Warren Barguil – YeahBaby! Sorry if I was snarky on Twitter earlier about your “anti-rider” comments. I agree with everything you say here! I was cross with lots of (mainly French) tweets hurling abuse at Uran and bemoaning Bardet not being in Yelliw. Sigh. I love Bedhead. But after this tour I love Wawa more. He’s been amazing. Not at all – I did take your comments on board and thought I should give him a break and it actually made for a better post 😎 But yes, Barguil! The entire Sunweb team actually – a great team from their Argonaut days and that same esprit de corps just keeps coming through with every new incarnation.